Led Zeppelin fans hoping that the band would announce a new tour this week will have to settle for the next best thing: a theatrical release of their 2007 one-night-only reunion concert. Entitled Celebration Day, the film will be released on 1,500 screens on October 17th. The concert – taped on December 10th, 2007 at London's 02 Arena – will then be released on "multiple audio and video formats" on November 19th. Check out a trailer for the movie below, featuring clips from "Good Times Bad Times," "Black Dog," Rock and Roll," "Stairway To Heaven" and "Whole Lotta Love." 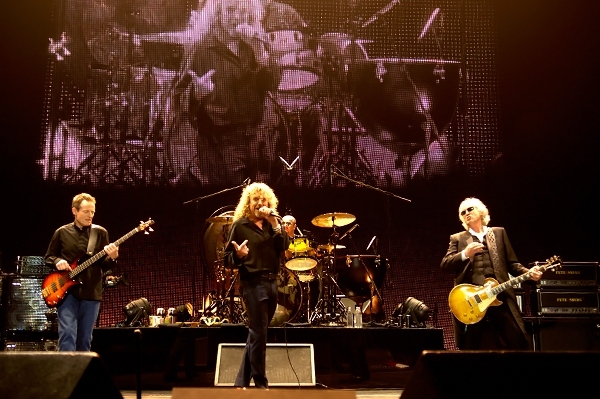 During the triumphant concert, Led Zeppelin played "like a band renewed, not merely reunited," wrote David Fricke in 2007. "Any doubts about Robert Plant's ability to still hit the high notes, his willingness to go stratospheric, were obliterated at the right, dramatic points in 'Since I've Been Loving You' and 'Kashmir.' John Paul Jones and Jason Bonham locked in like family. And Jimmy Page was a continual shock on guitar, mostly because he has played so little in public for the past decade." Afterward, there was intense demand for a tour, but Plant said he had no interest. "It was an amazing evening," he told Rolling Stone in 2011. "The preparations for it were fraught and intense, but the last rehearsal was really, really good, for all that it represented and all that we were trying to capture. But I've gone so far somewhere else that I almost can't relate to it." When asked again about any possible future reunion in that same interview, Plant made his position abundantly clear. "I see there's some kind of remit about the Tibetan Hook of the Paid that we have to keep going hack to," Plant said. "It's a bit of a pain in the pisser, to be honest. Who cares? I know people care, but think about it from my angle. Soon I'm going to need help crossing the street." It was also announced yesterday that Led Zeppelin will be one of the recipients of the 2012 Kennedy Center Honors in Washington, D.C. on December 2nd. Honorees do not traditionally perform at the ceremony. President Obama will speak, and another band will play their music. David Letterman, Buddy Guy, Dustin Hoffman and Natalia Makarova will also be honored at the event.